“ I have always striven to fix beauty in wood, or stone, or glass, or pottery in oils or watercolors, by using whatever seemed fittest by the expression of beauty; That has been my creed….infinite endless labor makes the masterpiece.” Louis Comfort Tiffany. The content of this book is fully described by this quote that appears in the first chapter. 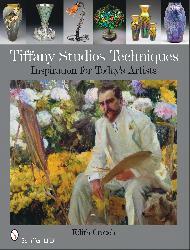 Tiffany was a superb artist who excelled in any medium as demonstrated in this book. Contemporary artists have looked at various examples of his work and discussed how they could be recreated today. The many detailed steps show a complicated path to achieve the masterpiece that Tiffany had desired. All of this is a very fascinating aspect of the ability that Tiffany had. Most of us think of art glass and stained glass when you first think of Tiffany, but he created so many other types of things. He did oil & water color paintings; photography; furniture; fabrics; rugs; mosaics; pottery; jewelry; metal work; and interior design. The nine chapters highlight his various types of work with 560 color photos that are absolutely breath taking. These include: The Quest of Beauty; Drawing, Watercolor, Oil Painting and Photography; Leaded Stained Glass and Sheet Glass; Mosiacs; Favrile Glass Blown Glass Vases, Vessels and Lampshades; Stained Glass Lampshades; Metalwork; Enamels and Jewelry and Favrile Art Pottery. The history of his interests is explained and what served as an inspiration for his work. Tiffany’s various examples are explained and how today’s artists utilize his techniques in their own work. 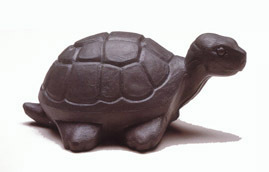 Detailed steps are described on how Tiffany’s work could be recreated today. The meticulous attention to detail show how much time was involved in designing all of Tiffany’s works of art. There are several different contemporary artists and studios that are mentioned in this book. A variety of examples and their steps to create them are shown. The artists are: Nancy Smith Couick; Steven Stelz; Lilian Broca; Lundberg Studios; Paul Crist; Century Studios; Scott Riggs; Gale Obler; Peter Scherpenzel; Peter Scherpenzel; Yukari Ura; Mayumi Sasaki; Zentrum Studios; Roberta Elliott; Linda Darty and Katherine Richey. The 9” x 12” hardback book has a dust cover on it. There are 320 pages that are absolutely filled with a tremendous amount of information. In the back is a detailed glossary that lists and defines over 130 terms. Included in the listing are techniques, types of glass, chemicals, tools and ingredients. There is a terrific bibliography and an index. A resource directory lists the various companies, their products, address, phone number and web sites. 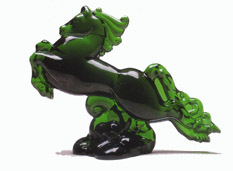 Under the production of sheet glass is Wissmach Glass in Paden City, West Virginia and Kokomo Opalescent Glass in Kokomo, Indiana. Even though the book retails for $100, the amount of information revealed about Tiffany and examples of his work make this a must have book if you are a Tiffany collector.